I cook a lot of Little Miss' food myself and try to experiment with different textures and flavours as much as possible, however, if we're out and about or in a hurry, I do reach for pouches as a quick and easy meal. I have a small number of trusted baby food brands that I use regularly and Plum Baby is one of that number so when they offered to send me some of their new range of savoury blends for Little Miss to try we were pleased to do so. Plum have launched their new range of savoury-led flavours to answer the concerns of parents that their children may be developing a sweet tooth at an early age. The new range is packed with interesting ingredients like quinoa and purple carrot and smoothly blended to create a first weaning food. All three blends incorporate a mixture of fruit and vegetables.Some of them are a bit more unusual blends but Plum can always be relied upon to go for less obvious mixes that work really well. I was pleased to see the inclusion of broccoli in one of the recipes as Little Miss had spat this out the first time I tried her with it as a purée and I wanted her to try it again. Plum choose their ingredients to maximise the nutritional benefits of the meals (hence the inclusion of purple carrots rather than orange, which have a higher level of antioxidants) and all of their blends contain quinoa which is high in protein. So what did Little Miss make of the meals? We've tried all of the flavours so far and all have been successful. Little Miss likes her food and she has enjoyed sampling these pouches. The photos show her trying the broccoli and apple flavour, the one I was most concerned about if she would like it, I needn't have been, she loved it. When she really enjoys a food she smacks her lips while she is eating, it's so funny, there was plenty of that going on with all three flavours. I think her favourite flavour was pear, blueberry and purple carrot as she actually cried when this pouch was finished! It's quite an alarming purple colour but, as I generally associate purple with being high in antioxidants this wasn't a concern. The sweet potato, corn and apple had a slightly thicker texture, perhaps due to the corn? As sweet potato is one of our weaning staples she enjoyed this too. I am a firm believer in not feeding my child anything I wouldn't eat myself (except bananas which are the devil's food and make my partner feed them to her!) I've tried all three blends. They do have a sweetness offered by the fruit but the vegetables give an earthier, savoury undertone which is missing from many prepared baby foods. The consistency of the pouches is very smooth and perfect for first weaning. Little Miss is just moving on to fork mashed food now but I would definitely recommend these to the parents and babies who are just embarking on weaning. We've used up our samples now but I would buy this range again to mix with baby pasta, as a more substantial meal for an older baby. I did this regularly with Bud and, again, it offered a simple, quick meal or one that could easily be prepared away from home (we used to take cold pasta in a bowl and mix a pouch with it when needed). 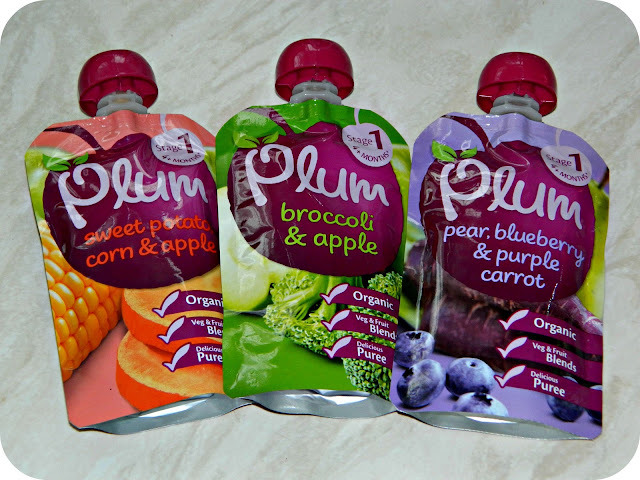 Disclaimer: We received a range of Plum baby food for the purpose of an open and honest review.